I cannot express to you all just how badly we need to move to the house already. The drive home is just killing us lately. Baby Girl usually konks out about 5 minutes after getting on the freeway due to her just playing all day at summer fun and somewhere along the way home, she’ll usually wake up and just start screaming bloody murder. It’s taken me about a week of these episodes to come to the theory that her neck is sore when she stirs, thus causing the banshee episodes. The only thing that seems to calm her down is yelling at her. Believe me, I’ve tried the nice cooing voice and all it does is make her start yelling at me to stop talking to her. This morning the commute was pretty long and the kids were just so sick of the car that they kept clawing each other. Eventually someone would scratch the other harder than was acceptable and some shrieking would start. Rinse and repeat this several times and I was ready to just jump out the window. Too bad mine doesn’t roll down. *sob* Electrical work should be starting soon and takes about 2 weeks and after that I can paint the bedrooms and we can move in. This is Baby Girl’s lunch. 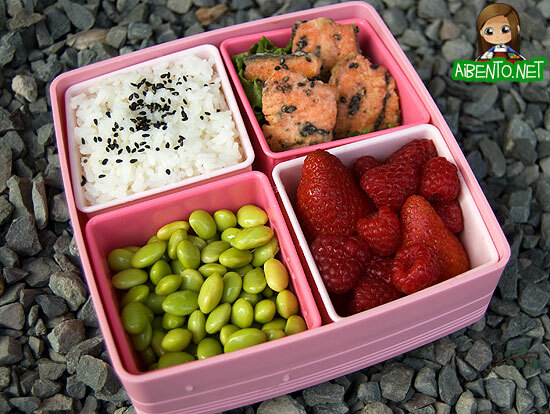 I’ve slowly been getting her used to taking her home lunch in a bento box and as I told Susan last Saturday, when given the choice between her sandwich in a bag and her sandwich in a bento box, she chose the bento box. Progress!!! I decided to brave going a little cuter with her today. She had requested egg salad sandwiches last night and instructed me to mash it with a fork, then mash it more with a spoon so that there was “no more yolk”. I skipped the spoon and just used the fork a little longer than usual. I used a little cookie cutter to cut out flower shapes and spooned the salad in. The box is lined with lettuce, then I put in some raspberries, which she seems to like now, golden kiwi, edamame, and cutie slices. To make the watermelon I cut cheese out with a circle cutter then cut it in half, then into fourths. I used a toothpick to color the slices with green and red food coloring to make watermelon slices. I was in a hurry, so they don’t look that great, but you get the idea. Once they were dry, I added some roasted sesame seeds to the top. I probably should have pressed them into the cheese, but I only thought of that later. I’ll try it again another day when I’m not so rushed. 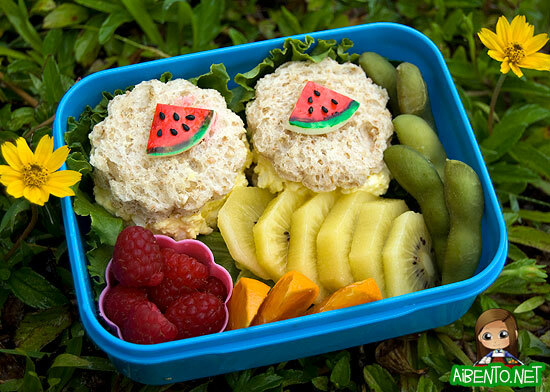 It makes for a great summer themed lunch, though, don’t you think? Here’s my bento for today. I made teriyaki salmon last night and so before I put it into the pan, I cut off a small slice for myself and put it away. This morning I salted and peppered it, then added sesame seeds, dredged it in flour, then pan fried it in olive oil. In the other sections I have rice, edamame, and some fresh berries. Lunches like these are why I love this box. You can place your starch, protein, veggies, and fruit all in separate containers and still have a very nice looking lunch. Sadly, I can’t remember where I got this box.